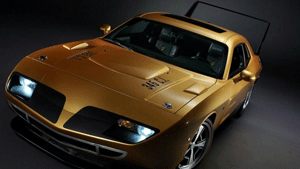 The Plymouth Superbird and Dodge Daytona where and are still head turners. Who could miss that huge spoiler on the back. NASCAR racing was huge and it was a big deal for a manufacture to have their car win. The Superbird, a modified Road Runner, was Plymouth’s follow-on design to the Charger Daytona fielded by Dodge in the previous season. Chrysler didn’t just slap on the aero stuff and get it out the door. It was the first American car to be designed aerodynamically using a wind tunnel and computer analysis. Only 1,935 Superbirds were built. Not only collectible now because of the look but also the ginormous amount of horse power packed under the hood make this highly collectible. A good example will go for well into six figures. See more history here. This is over the top cool. Developed by Joel Highsmith who took a 2008 Dodge Challenger pounding in 1,000 hp in the engine bay it has a top speed of 194 mph. I am still drooling. 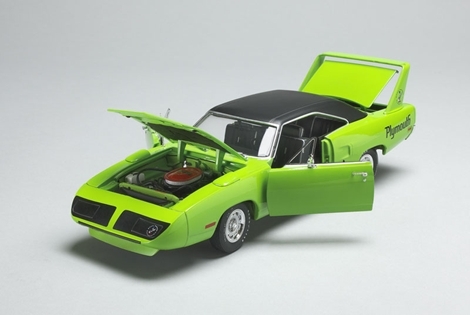 I’m dating myself and the collectors who’ll really appreciate this nicely detailed Superbird, complete with the cartoon Road Runner logo on its magnificent towering rear wing and another on the flat black headlight door on the car’s streamlined nose. The Superbird was created to race in NASCAR and followed on the heels of Dodge’s Charger Daytona, which debuted in 1969. Both had a big rear wing to create down force and a wedge-shaped nose to aid aerodynamics and allow the car to slip through the air more quickly. But at the time, to race a car, the automakers had to sell the same body style to the public, whereas now NASCAR’s racers are everything, but stock. So in 1970 Plymouth introduced the Road Runner-based Superbird for the racetrack and made 1,920 of the high-winged birds for the street. But it was one and done, the Superbird only flew out the showroom doors in 1970.